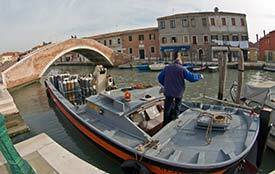 A barge loaded with bottles of cooking gas prepares to cast off from a quay near the Basilica of Santi Maria e Donato. 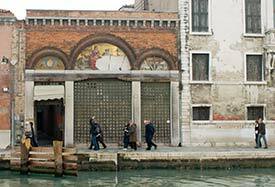 Not far away, tourists approach a glass factory and showroom where a decaying mural of gilded glass mosaic fills the arches above the entrance. 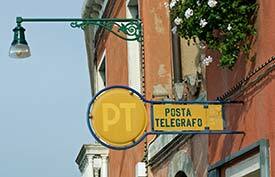 Head left from the Colonna waterbus stop, and you'll encounter signs for a glass factory that offers free glassblowing demonstrations. 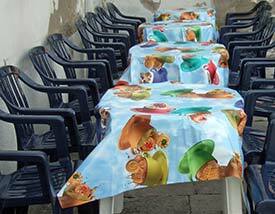 Coffee and cookies are the theme of this café's colorful tablecloths. 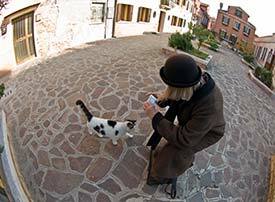 A lady in a hat meets a cat in a residential square. 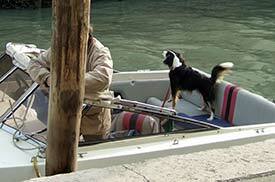 ...while others prefer to relax on land. 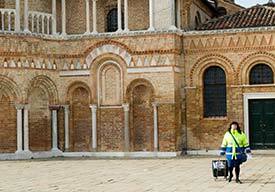 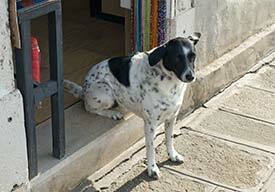 ...and a postal carrier ensure that mail is collected and delivered on Murano. 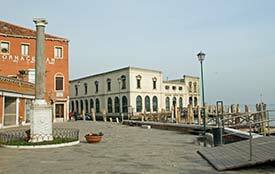 Venice's winged lion has a counterpart on a Muranese wall. 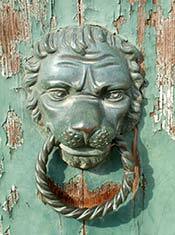 A wingless version of the leoni gnaws on a doorknocker. 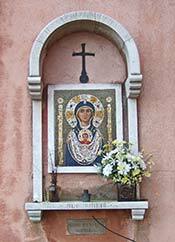 A Byzantine-style Madonna occupies center stage in an outdoor shrine. 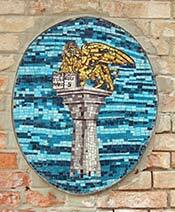 Decorations of mosaic tile enliven an otherwise blank stucco wall.